Nyd alt Girona kan tilbyde: kultur, museer, god mad, smukke strande, og verdensberømte cykling fra et hjem base, der er bekvemt placeret og klar til at byde velkommen til din familie eller gruppe. Lejligheden har udsigt til Girona Katedral og træerne i San Daniel dalen, og du kan nyde den spektakulære udsigt fra balkonen eller Enten tagterrasse. Det er meget rolig med kun lyden af ​​fuglene og klokker fra katedralen nedenfor. Der er tre soveværelser, et med en queen size seng og to mindre soveværelser hver har to singler, der kan sættes sammen, at hvis man kan lide, og et badeværelse med bruser og gulvvarme. I stuen har en pejs til vintermånederne til at holde dig varm og hyggelig. Køkkenet har alt hvad du behøver for at forberede store måltider du kan nyde i Hvilket spisestuen, på altanen eller på den private tagterrasse, mens du nyder en panoramaudsigt over byen. Den store terrasse har masser af planter, en tagterrasse grill og et brusebad. Der er også en indkøbskurv med en cykel for zippe omkring byen. Der er selvfølgelig også en vaskemaskine og højhastigheds internet. Beliggende i San Daniel kvarter Girona, lejligheden er en hurtig taxatur fra togstationen (€ 10) eller en meget flot halv time gåtur. Dette område har mange fordele, da det er tæt nok på den gamle bydel At det er nemt at gå til alt, men samtidig let fjernes fra alle støj og aktivitet. En fem minutters gang (med en stejl bakke) får du fred og ro og en fantastisk udsigt. Der er masser af butikker tæt ved (købmand, slagter, bager), såvel som mange, mange caféer restauranter og barer. Hvis du er en vandring entusiast, vi er på vej, der fører lige rundt om hjørnet til de mange smukke vandrestier i San Daniel dalen. Spacious apartment with great views and very convenient location! This apartment is worth the 80 - 100 mts of steep hill and about 30 steep steps you have to go through to get to it! It’s spacious, well equipped with a gorgeous terrace & a balcony with beautiful view of the trees, hills and the cathedral. We, a family of 4, stayed here for a week very comfortably. Our only complaint was the bad smell that came from the wash basin and the not-so-powerful flow of the shower. We did let the manager know about the stench from the basin and it was looked into very promptly. The smell was ok for half a day but came back. Think given as a feedback it can be taken care of and improved for the future. But overall we had a great stay. The apartment is so well located ... it’s located in Sant Daniel ...not far from the monastery and just 5 mins walk to the old city, restaurants and the shops....and yet you can enjoy the peace and serenity around! I look forward to going back and would highly recommended this place. A fabulous stay here, the views from the balcony and roof terrace are just amazing. Five minute walk to restaurant and fab cocktail bar, 10 min walk into old town. Girona is such a beautiful laid back City, we can’t wait to return. All communication from booking to arrival to return of deposit has been excellent. Trevlig lägenhet på ca 10 min promenadavstånd från den gamla charmiga delen av Girona där det finns gott om restsuranger och barer. Härlig balkong och charmig takterass med kylskåp, grillmöjligheter etc. Och fin utsikt över Girona. Excellent. Great location, very clean and well maintained property and very well equipped kitchen. Girona is beautiful. The apartment in Girona was everything it was advertised to be and more! Overal, the apartment is wonderful! The terraces are a real plus! 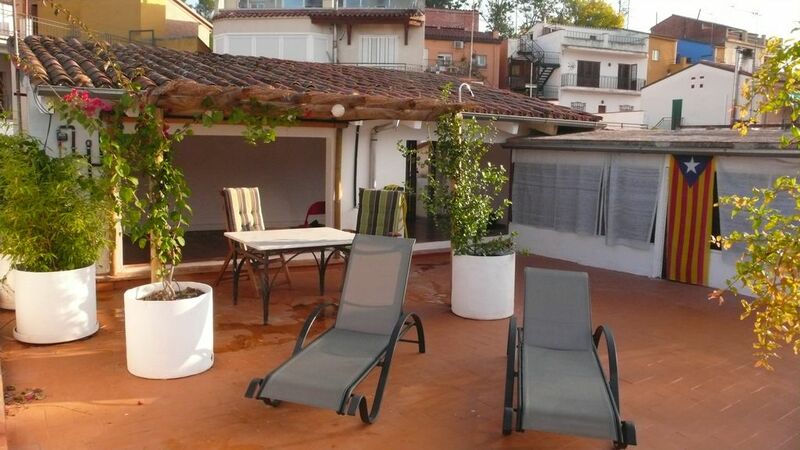 The location is quiet and very convenient to the city center and all the sites. Girona is a great city worth a stay! We loved our experience. Our stay was terrific. The location could not have been better. This apartment is tucked into a hillside, steps above lovely cobblestone streets, medieval buildings & stone walls, and beautiful narrow alleyways in the romantic older section of Girona. It is a ten minute walk to enjoy the bustle of daytime activities or the enchanting nightlife and terrific restaurant options in the old town. Walking paths and bike routes are super close and easily accessible. We rented bikes and spent a day exploring a number of nearby medieval towns - so beautiful. It was always nice to return home to the warmth of the wood furning fireplace . The rooftop terrace is simply stunning. Make a little something in the (well equipped kitchen), grab a bottle of wine and head to the terrance to watch the sunset drop behind the main cathedral, listen to the belltower toll and gaze out on an unobstructed view of the surrounding landscape. I recommend this home to friends and family who want the flexibility of pursuing active outdoor activities or choosing to relax in a comfortable indoor environment.